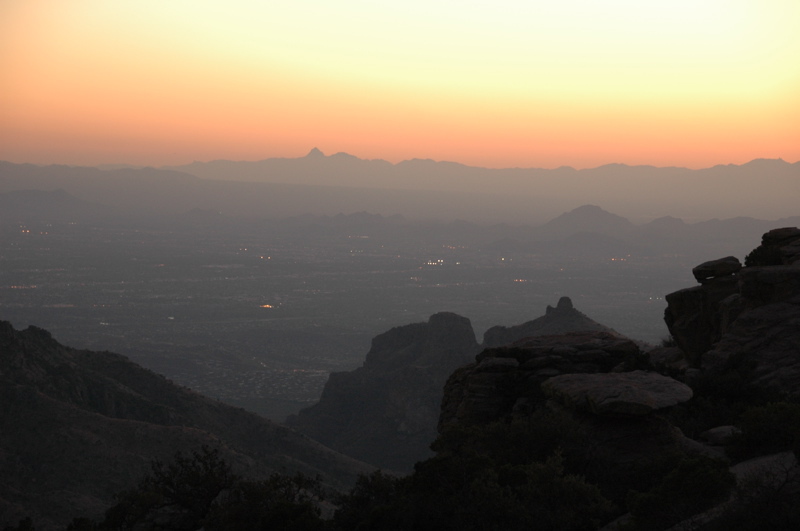 Rising far above Tucson to the north is the Santa Catalina mountain range. This range is one of the southwest’s “Sky Islands,” which means it pokes up through the desert heat to reach the cool upper-altitude air at 9,000 feet. Sky Islands like the Catalinas are aerial oases, with deep forests of Ponderosa Pine at 6,000 – 8,000 feet, and sub-alpine terrain above that. Imagine that we are living at the bottom of the Pacific Ocean. A rift in the floor allows a volcano to crack through, and the rising cone of the volcano eventually penetrates the sea and forms a Hawaiian island. That’s what a Sky Island is like. Up above, it’s an entirely new world, with completely different climate, creatures, and plants. I think the Sky Islands are one of the more remarkable features of the desert southwest. We aren’t just baking on a flat plain of dry desert with featureless sand dunes everywhere. (That’s the Sahara.) From Tucson you can look in any compass direction and see a Sky Island. They are beautiful on a clear day. We can see half the Catalina range from our kitchen, and there is no view I enjoy more. But better than seeing them is ascending them. Most of the Sky Islands are National Forest land or other public lands, and they are easily accessed by hiking trails. 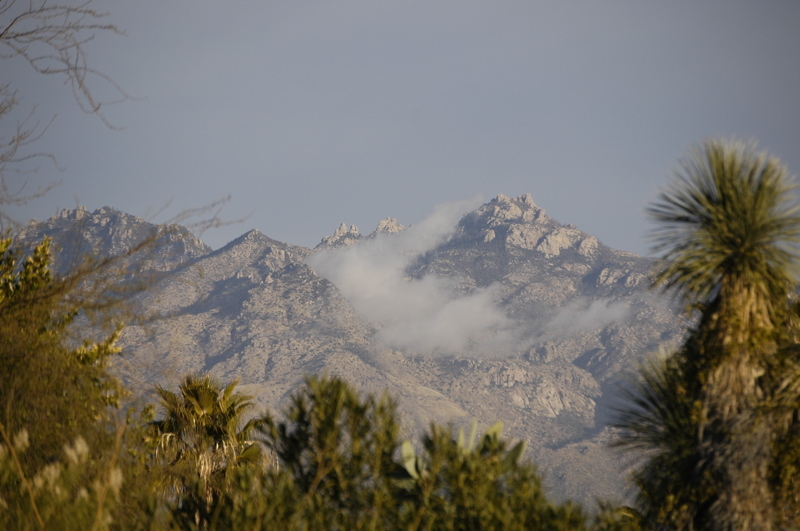 The Catalina range is even easier to reach: there’s a road that winds all the way up from Tucson, passing multiple spectacular viewpoints, to the very top where there’s a ski area and the small town of Summerhaven. As you might guess, driving up is a popular activity in the summer. It’s often 30 degrees cooler at 8,000 feet than it is down in Tucson, and there are several campgrounds along the way. For each thousand feet you climb, the air gets cooler and the chance of precipitation increases. 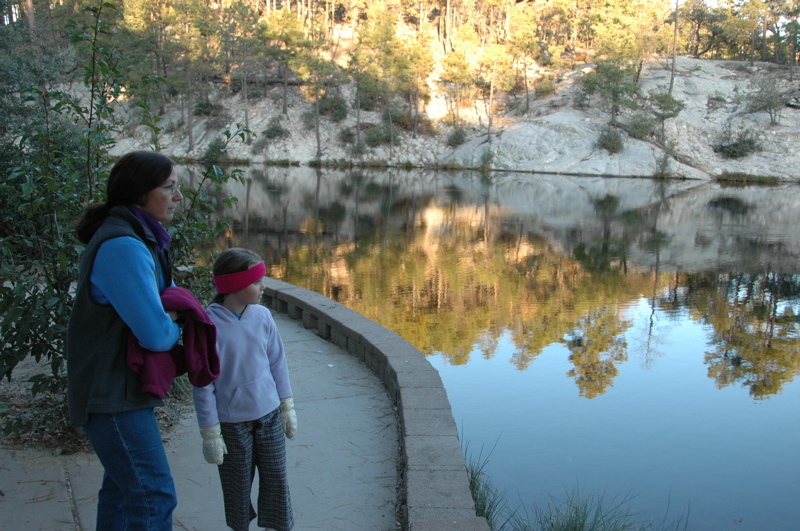 If you ascend to the very top of Mt Lemmon, you are in a climate equivalent to Banff, Alberta. Now think about that: In 30 minutes of driving, we can go to Banff. Up there, the evergreen trees and the mountain peaks tower around us, and there’s snow in the winter. We can put on our warm coats and hats, smell the pine forest, walk the little ski town and drop in on the local store for hot cocoa by the fire. And then, when our need for a reminder of our northern roots is satisfied, we can drive 30 minutes back and be in the Tucson sunshine at 70 degrees with the palm trees. Who needs a jet when we’ve got this right in the backyard? Yesterday we took a trip up to about 7,000 feet, just exploring. That’s the equivalent of a trip to (roughly) Montana, in terms of climate change. We were dropping into the various campgrounds along the way, looking for one we’d like to visit with the Airstream sometime. Most of the campgrounds are suitable for tents only, but at least two can take RVs, including Gordon Hirabayashi Campground (about 5,000 feet altitude) and Rose Canyon Campground (about 7,000 feet). Rose Canyon was a nice surprise. The camping area is large and very spread out in multiple loops. ($18, water, bathrooms, no hookups, no dump.) Toward the lower end of the campground is a small man-made fishing lake, stocked with trout. Emma loves fishing, so this was a big hit with her. Some friendly folks at lakeside let her take a few casts with their equipment, and while we were watching one of them landed a little trout. The lake and campground will close at the end of October, so we may not get to camp there this year, but I can see a trip next year when the weather gets warm again. Eleanor is already talking about getting a fishing pole for Emma for Christmas. Although many of the spaces are short or unlevel, we’ve identified about ten that we can get our 30-foot trailer into. The road up through the Catalinas costs $5 if you don’t have a pass (the “America The Beautiful Pass” works here, since this is a National Forest road). As a visitor to the area, it’s the best $5 you’ll spend in Tucson, in my opinion. The total drive is about 60 miles roundtrip and takes at least two hours if you only spend a little time at each of the many overlooks. If you take your time and stop in Summerhaven for lunch or browsing, it can easily be a full day. Here’s a tip: try to time your return to Tucson for sunset. The views will range from nice to amazing. Even a rare cloudy day is beautiful to see as you descend the winding road to the valley floor. The air is normally very clear here (yesterday we had still air and so there was a bit of haziness), yielding superb viewing of stars, full moon, and city. I’m reminded that when we are not exploring the country we’ve still got a local area to explore. 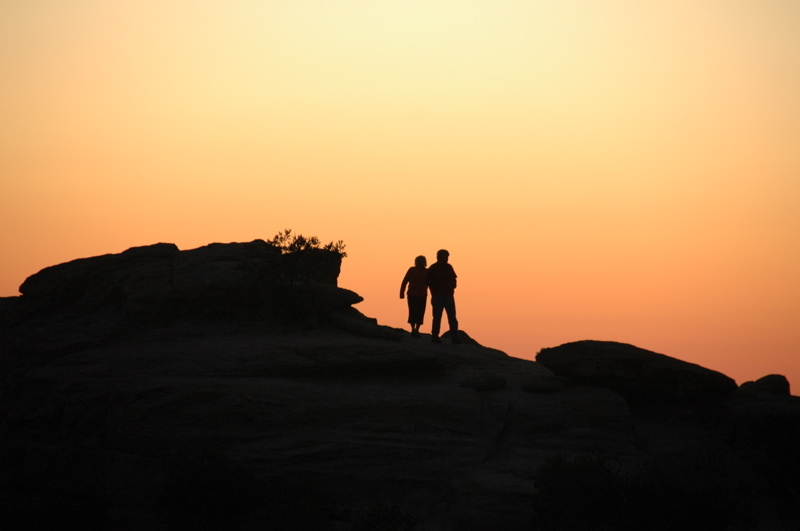 One of the reasons we chose Arizona for home base was the broad range of year-round recreation available. The southwestern outdoors are like a galaxy: beautiful at a distance, and full of richer detail the closer you get. We can enjoy the Sky Islands at a distance, but every step closer yields new views and new things to see. Driving them is one perspective, camping in them is another, hiking them is another, and then activities like birding give even more perspective. Given that there are five Sky Islands within sight of Tucson, we’ve got a lot yet to see. It’s just a matter of readjusting our mode of exploration. Instead of driving north to the real Banff, we’ll be exploring the climate and ecosystem of Banff from our backyard in Arizona. Rich: I am the “Alberta yogurt man!” I have so enjoyed reading your blog since inception and learning so much about places to stay, things to do and insights about living life to the fullest. Glad you are getting settled. I was quite surprised to read about one of the campgrounds you mentioned in today’s blog. It just so happens that Gordon Hirabayashi was the chairman of the sociology dept. at the University of Alberta who hired me right out of graduate school. He is the reason I came to Canada and, for a variety of reasons, I am now a Canadian citizen. He was a very humble and quiet man but very principled. After more than a year in the department I found out who he was and what he had done regarding WWII internment protests. I had no idea he was in an Arizona prison camp nor that a campground had been named after him. I will continue to follow your blog for more interesting tidbits. While a Canadian I remain a yankee at heart and sincerely hope Obama is the next president! Thanks for continuing to blog. Your area sounds really neat – you may end up with a bunch of twinkies in your town! Too bad the campground closes. We have fond memories of Mt. Lemmon from our birding days in the late 70’s. No Airstream then…only a Bethany popup. We arrived late on a Sunday and had to wait for the locals to leave in order to find a campsite. They did leave; all night long we listened to the roar of vehicles driving down the mountain. Monday morning the campground was empty. Another sky island is over by the Chiricahua NM. The hummingbirds were abundant and the elegant trogon…worth waiting for!